Ice anglers are always looking for ways to make their experience on the ice easier or more enjoyable. Here are six hacks that will improve your angling adventures this winter. One of the most frequent problems anglers face in the winter is ice build-up on rod guides. Not only does the ice make it difficult to release and reel in line, it can also damage your line, making it more prone to unexpected breaks when fighting a fish. It’s true that petroleum-based products like WD-40 can keep ice off your rod guides, but they can also damage your line. A better choice is to smear a natural lip balm on your guides, such as Burt’s Bees. Just coat your guides with the balm and your guides will remain ice free. Some anglers use dry fly floatant, which can also keep the ice off your guides, without damaging line. Keeping a good grip on your rod can also be a challenge during the ice fishing season. Ice can build up on your rod handle and gloves, which can makes it difficult to keep a solid grip on the handle. You can improve your grip with the same technique used by hockey players. Purchase some hockey tape. Cut a length of it and roll it length wise, with the sticky side out. Wrap it along the length of your rod handle, leaving a one-inch gap between each wrap. Next, take your roll of hockey tape and cover the entire handle and your rolled wrap. This leaves a nice ridge on your handle that makes it much easier to grip. When your reels are exposed to extreme cold, the general-use greases or lubricants can fail, becoming thick or gummy. To ensure your reels are working at any temperature, use a micro-polymer lubricants which will perform well, even in the coldest winter temperatures. Keeping your hole in the ice free of ice build-up can be a headache. Scooping ice out of the hole every 10 minutes gets old. You can keep your hole free and clear of ice by floating hand warmers in the hole. Hand warmers crank out a decent amount of heat and will prevent ice from building up while you are fishing, allowing your bobber to operate properly and allowing you to jig obstruction free. You can combine ice fishing and fly fishing by using some popular fly patterns to fish for panfish through the ice. Sunfish and crappies love nymphs and other insects. To capitalize on this, use a bead-head or otherwise weighted nymph when jigging for panfish. Not only is it a bait that has a proven ability to consistently take fish, it also is a bait that fish are not use to seeing during the winter months, which may give you an advantage in heavily fished areas. 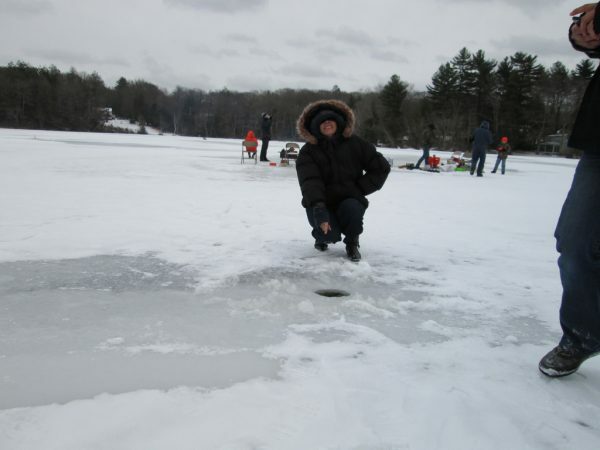 Unsafe ice is a frequent concern when ice fishing. Falling through the ice often ends tragically, which is why you want to improve your odds of survival if the unexpected occurs. You can dramatically increase your odds of survival by wearing a life vest under your winter gear. Not only could it potentially save your life, it can also provide added warmth, during your ice fishing adventures.